From left are James Balmer, son of winner, award presenter Craig Libuse, award winner Chuck Balmer and his wife, Julie Balmer. CARLSBAD, Calif. – Each year since 1997, the Joe Martin Foundation for Exceptional Craftsmanship has presented an award to the Metalworking Craftsman of the Year. The winner is selected as the “Best of the Best” within an area of craftsmanship at the miniature end of the size scale. This area of specialty was chosen because the late Joe Martin was the owner of Sherline tools, a manufacturer of precision miniature machine tools. He opted to concentrate on miniature craftsmanship because it could be produced in a home shop and added a level of difficulty to the creation of complicated, working mechanisms. Most winners are not in it for the money, but rather for the satisfaction of building to the best of their abilities. This year’s winner is Chuck Balmer of Urbana. He is the 22nd winner of the award, which was presented at the North American Model Engineering Society Expo in Wyandotte, Michigan, on April 21. The award includes a check for $2,000, a certificate and an engraved medallion. Miniature live steam locomotives are historically at the heart of the hobby of model engineering, and Chuck Balmer’s latest creation is an outstanding example combining many facets of metalworking skills to create a working masterpiece in a small scale. His latest project, a highly detailed and fully functional, scratch-built, 1/16 scale 2-6-6-6 C&O “Allegheny” sets the standards for this type of live steam model. Prior to building this engine, he built, restored or finished about a dozen other working model locomotives of all types. “Chuck’s work is without parallel, and his contributions to locomotive modeling are immense. He is most recognized for his 1:16 scale Allegheny, a tour de force in modeling that required him to create parts from measurements and photos, build his own patterns, and cast parts in his home-built foundry. This locomotive is in the small ¾” scale, the small end of rail park locomotive construction. He is a prolific and meticulous builder who is a resource and mentor to other builders. We believe Chuck Balmer epitomizes the Joe Martin Foundation’s ideals. Balmer is a retired electrical engineer, who designed aerospace testing equipment, data systems, and even robots, while preserving the technology of the railroad age through painstakingly accurate working locomotive models. 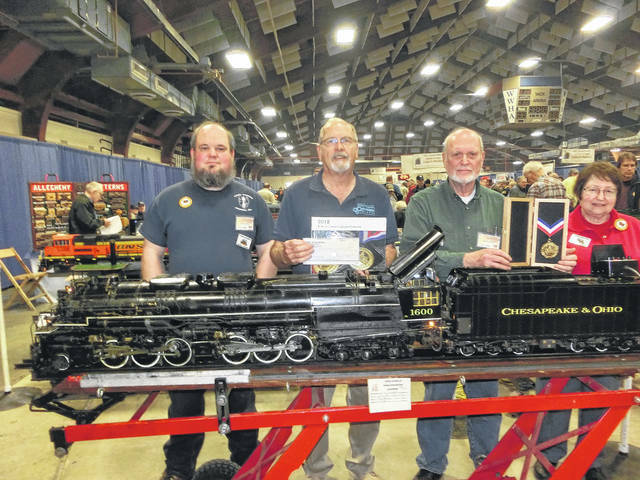 The jewel of his collection is a 1:16 scale 3-½” gauge live steam scale model of the 2-6-6-6 Allegheny locomotive built by the Lima Locomotive Works in Lima, Ohio, an effort that took 14,000 hours and more than seven years to complete. Balmer was inspired to model steam engines by memories from his youth of watching The Wonderful World of Disney on TV as Walt drove a scale steam locomotive around his property. After graduating from the University of Dayton in 1968, he built and equipped a home machine shop and an electronics lab; built a foundry to cast his own parts; learned pattern making and welding; and honed his machining skills by building a stable of locomotives in the small ¾” scale as well as two robots. Balmer’s story and photos of his work can be seen in greater detail at the Joe Martin Foundation’s Craftsmanship Museum web site at www.craftsmanshipmuseum.com/Balmer.htm. Live Steam magazine published a feature article on him in the Jan/Feb 2018 issue. Story from the Joe Martin Foundation for Exceptional Craftsmanship.